Exposed time flow direct flush kit 1"1/4 with elbow stopcock F1"
Elbow F1 chrome-plated brass stopcock and flow/volume rate adjuster. Chrome-plated solid brass body and push-button. Bright polished stainless steel elbow flush tube Ø 32mm with nut and collar. Connection washer Ø 32/55mm with clamp. Goods arrived ahead of schedule - emails not. 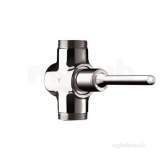 Why choose MyTub Limited for delabie tempochasse exposed valve 1 1/4 inch 7sec plus elbow stopcock 760005?